Senior citizens from the Acting Up theatre group have joined with Ministers at Stormont to raise awareness of how the arts can enrich the lives of older people. The Acting Up group`s ‘A Beginner’s Guide to Growing Older’ represents one of the many attractions at the Imagine Arts Festival for older people – the first ever event of its kind to be held in Northern Ireland – taking place at Belfast Waterfront on Saturday 8 and Sunday 9 June. Presented by Belfast Waterfront and Kaleidoscope, the Imagine Arts Festival, celebrates older peoples’ enjoyment of the arts, highlights the positive role the arts can play in their lives and aims to encourage older people to get involved. 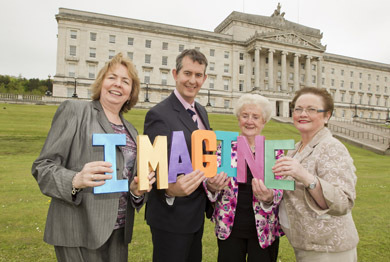 The Imagine Arts Festival for older people – at Belfast Waterfront on Saturday 8 and Sunday 9 June. Senior citizens from Newry’s Acting Up theatre group are pictured with Health Minister Edwin Poots – from left, Councillor Bernie Kelly, Chair of Belfast City Council’s All Party Older Peoples’ Group and Angela Finnerty and Margaret McArdle from Newry’s Acting Up group. This unique two-day event features a bumper programme of arts events, performances and workshops, offering the young at heart the chance to try their hand at a wide variety of different art forms, with workshops on offer across a wide range of pursuits, from creative writing to ballroom dancing. Thousands of older people across Northern Ireland participate in some form of arts activity every week, either privately or as part of a group. Enjoying the arts can create a huge impact on older people’s lives, improving physical and mental health, combating isolation and depression, helping them to stay connected with their friends and their community and enabling them to express their imagination and creativity. Supported by Belfast City Council, Imagine Arts Festival takes place at Belfast Waterfront on Saturday 8 and Sunday 9 June.